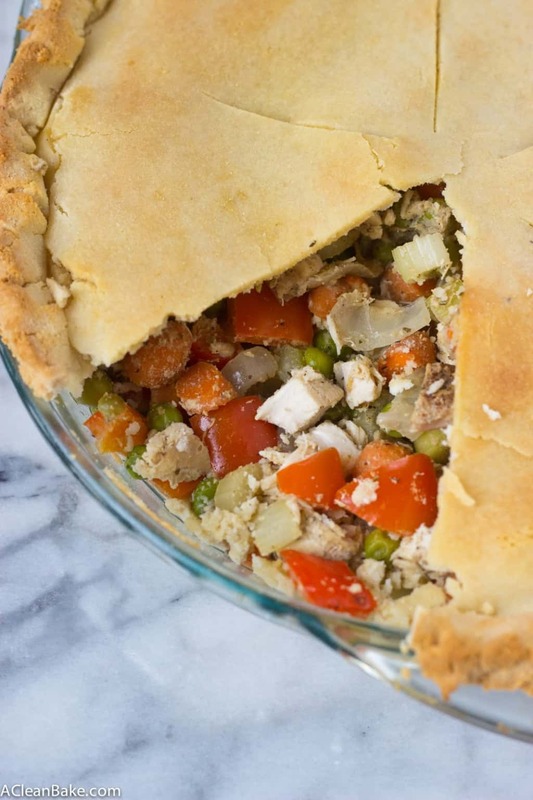 This paleo chicken pot pie is a low carb and gluten free version of your favorite comfort food. This yummy, single crust recipe that makes a great dinner! I didn’t grow up in a pot pie family. In a health-conscious house, a creamy, buttery, meaty comfort food just wasn’t on the menu. 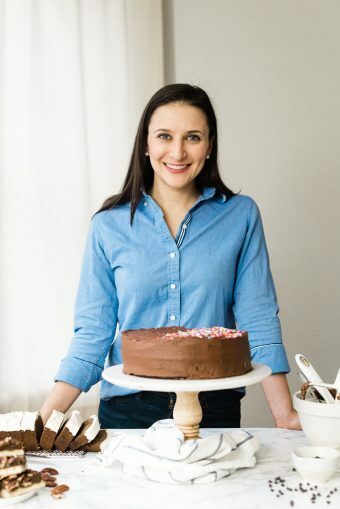 So, I really have no explanation for my recent obsession with this dish – though, of course, the one we have been eating is a version that I put a healthy, grain-free slant on. 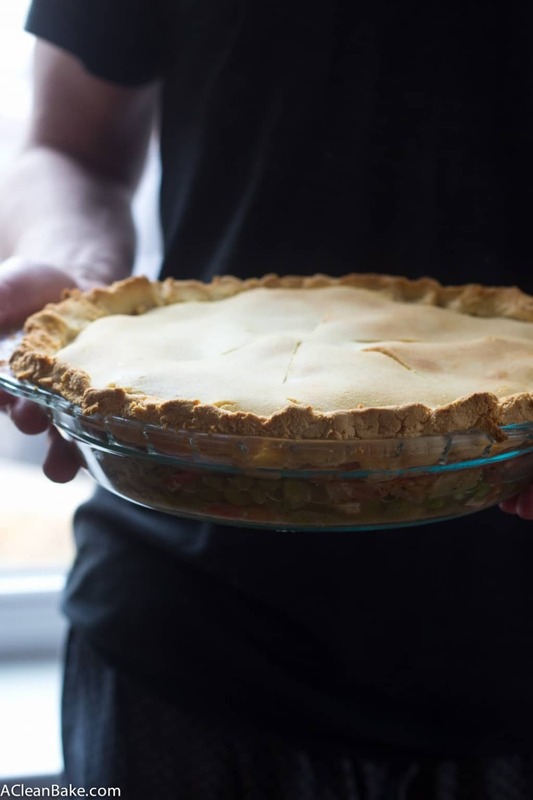 Why didn’t I discover chicken pot pie sooner? It’s a brilliant guise under which to clean out the produce drawer and it’s full of fat, sweet green peas, which I kind of have a thing for. Plus, there are plenty of leftovers and, let me tell you, easy entrees that last for a few meals are pretty key right now (right, who are we kidding? Pretty key always). 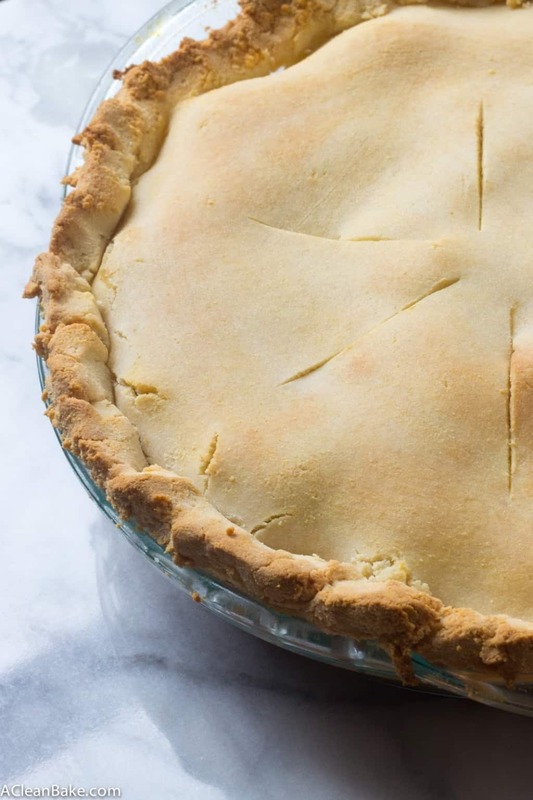 Don’t be mistaken: even though it is a healthier version, it is still the warm, filling and flavorful dish that a pot pie is supposed to be. But instead of cream and butter, you get tons of flavor from one of my favorite spice mixes, herbs de Provence. It’s not as soupy (though, if you want more gravy, you can easily adjust the recipe. There are instructions in the notes), but the filling is moist and satisfying and the crust is crispy and golden brown. Best of all, this is a quick and hearty dinner that can be prepared in advance and baked as soon as you get home from work for a delicious weeknight meal. PS: Don’t worry; this is the last meat dish for awhile. We’ll go back to desserts on Thursday! In the bowl of a food processor, combine the almond flour, coconut flour and salt with a few pulses. Then cut in the cold vegan butter by pulsing until it is mostly incorporated and only pea-sized pieces are left. Then, with the processor going, add the buttermilk in a thin stream until it comes together in a ball that is not too sticky. You may not need the entire 1/2 cup (I only used 1/4 cup + 2 Tablespoons). Turn the dough out onto a floured surface or piece of wax paper and roll out with a floured rolling pin (or cover another sheet of wax paper) into an 11″ circle. Wrap in plastic and chill in the refrigerator while you make the filling. In a large, deep pan over medium high heat, melt the butter or oil and add the coconut flour and stir until the butter or oil is absorbed. It will be crumbly and dry. Let it toast for a minute or two until the color deepens slightly. 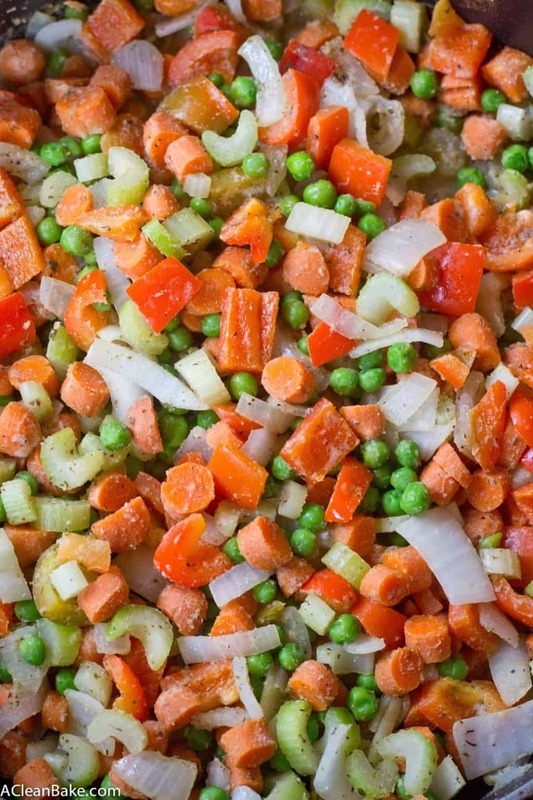 Add the vegetables and toss to combine and coat them with the coconut flour. Then add the chicken stock, herbs and spices. Cover and let it cook down until the vegetables are tender. Turn off the heat, add the chicken and toss to combine. Transfer the filling into a 9″ pie plate. It will seem like a lot but pack it in tight so it all fits. Cover the pie plate with the dough and seal around the edge of the pie plate (crimp or discard the excess). Carefully slice 4-6 vent cuts into the top of the crust, and brush the top with egg wash (1 beaten egg + 2 Tablespoons milk of choice) or oil. Bake for 35-45 minutes until top is golden and filling is bubbly. (1) You can do a lot of this in advance, like preparing teh filling and making and dough for the crust. Store it all in the fridge and let the filling come to room temperature before rolling out the dough, topping it and baking. (2) If you want more gravy in the filling, add 1/2 cup of almond or coconut milk when you add the chicken at the end. (3) If you would like to make this vegan, replace the chicken with one can of chickpeas (rinsed and drained) and brush or spray the top with oil, instead of using the egg wash, before baking. (4) To make vegan buttermilk, gently stir 1 teaspoon of lemon juice into 1/2 cup almond milk and set aside for about 5 minutes to curdle slightly.